Stop what you're doing. Stop reading this. Close your browser... including the LOLcats window. Actually, keep one window open, go to Madman and order Pluto volume 1 by Naoki Urasawa. I have never been more excited, nor more emotionally invested in a single manga volume the way that I am about Pluto (プルートウ) volume 1. 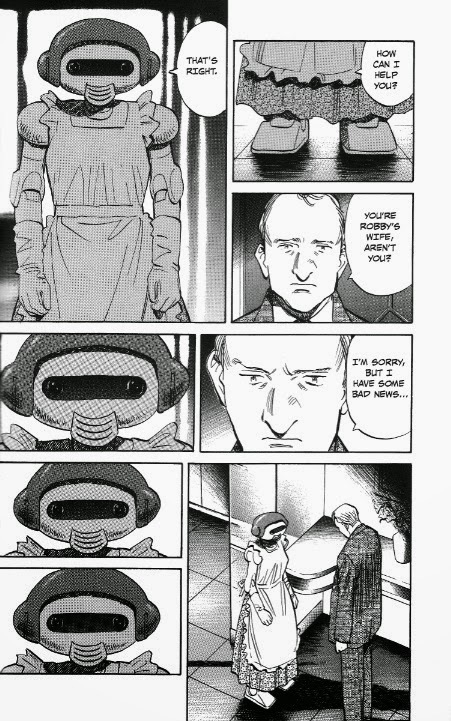 What makes this all the more impressive is that the story is about robots, so emotion shouldn't necessarily be a given. Retelling what is arguably Osamu Tezuka's greatest Astro Boy story arc, "The Greatest Robot on Earth", Pluto is gritty, grim and potentially surpasses the source material in terms of execution. The Astro Boy franchise, furthermore the Tezuka brand, is notoriously picky about licensing the likeness of its character for third party release which is fair enough when it is generally credited as being the birthplace of modern manga and anime. Considered to be the "God of Comics" and the "Godfather of Anime", Osamu Tezuka offers some mighty big shoes to fill, especially if you expect to take on his most critically and publicly acclaimed story. Enter Naoki Urasawa. 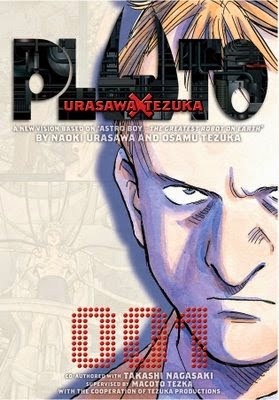 By all accounts, although Urasawa was already well known by the time he started this project, he faced an uphill battle in convincing Osamu Tezuka's son, Macoto, to allow him to take on the story. Thankfully it all worked out as well as it did. Reimagined as a murder mystery, Pluto tells the story of European detective Gesicht who is investigating a spate of related murders. While both humans and robots have been killed, all evidence points towards the killer being a robot. Urasawa knows how to build suspense to great effect and with Monster and 20th Century Boys under his belt, it should come as no surprise that he has the ability to weave tales of intrigue unlike any other creator. However, weighing in at a slight 8 volumes means that Pluto needs to weave and unravel these mysteries at a cracking pace. In less capable hands this project would run the risk of feeling rushed, but not in the mitts of Urasawa. In the very first volume alone, Urasawa manages to build a world which is familiar to fans of Tezuka's work, but yet approachable to those unacquainted. Furthermore, he establishes a vast cast of characters who all receive enough page time and injections of personality that they are instantly important. No page space is wasted with dialogue, or a lack there of, hitting every beat, keeping the story rolling along at a hefty pace. Not only is the story pitch perfect, but the art, also supplied by Urasawa, dances a wonderfully fine line between cartoony and lifelike. Characters still sport comedic physical proportions at times, not unlike those created by Tezuka, but this is done in a far more subtle way than someone such as, let's say, Daddy Walrus. Robot designs are still somewhat comedically designed, reminiscent of the original character designs utilising round, pseudo-human forms and add charm to what sometimes threatens to be a rather emotionally heavy volume of work. Backgrounds are all highly detailed and framed in a manner which is more cinematic than any manga series you're likely to see elsewhere. If Osamu Tezuka is the god of manga, i firmly believe that Naoki Urasawa is the greatest living manga creator, a title which could very well extend to the broader realm of sequential storytelling. Pluto captures the charm established in Tezuka's work while stripping back much of its levity in favour of a gritty and rich murder mystery. 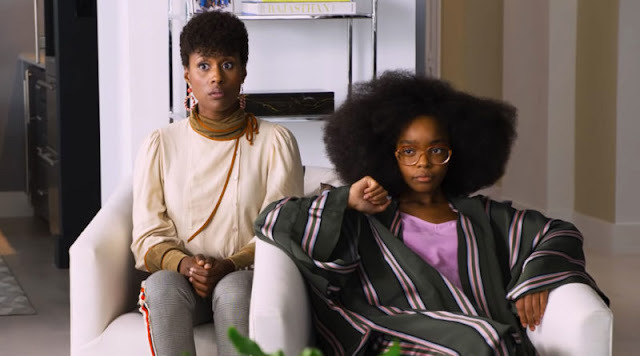 This is storytelling at its absolute finest. Pluto Volume 1 is available from Madman from the 10th of August.